Sound engineer working at mixing panel in the boutique recording studio. Music production computer is the center of your audio universe. Whether you want to start making music or to change your current music hardware setup you need to consider this. Apart from audio interfaces, studio monitors and many other stuff you need a computer. Choosing the right computer for music production is really important. 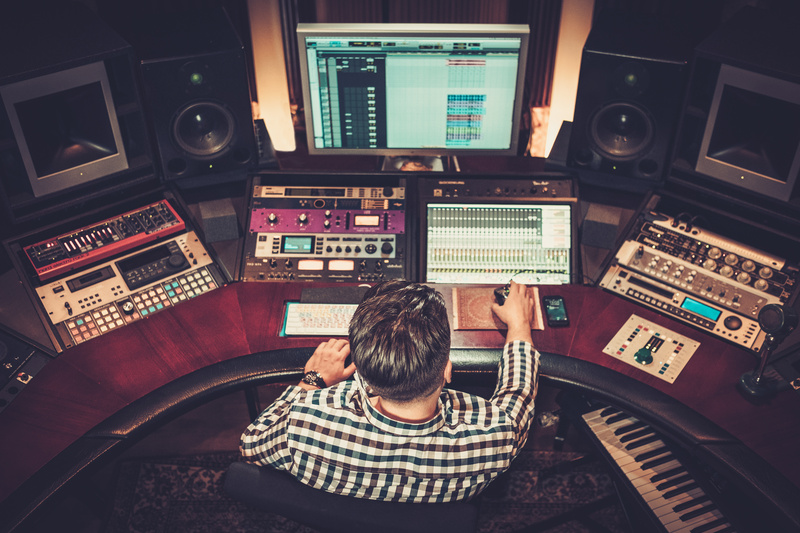 Here are some golden principles about choosing your music production machine. The order is not obligatory but should be convenient. I will not give you specific hardware models. The market changes so fast that next month this list would be out of date. For the tech specs look at discussion forums like Reddit or KVR Audio. You don’t have to limit yourself to these places but from my personal experience I can tell that there are very active and helpful communities. They won’t leave your question unanswered. There are many DAW programs out there. There are also two major platforms where these programs run. The discussion which to choose, Windows or Mac, is endless. Remember however that your DAW might run better on Windows platform, or be windows only. The good example is FL Studio. There are also some Mac-only like Logic Pro. I assume that you have already chosen your DAW. If not, you can read this article about digital audio workstations. It should help with choosing the right one for you. In general a desktop computer is cheaper, has better performance and the ability to easily replace its components. One computer can serve many years with occasional cleaning up inside and replacing its parts. But, you can’t take a desktop computer for a gig. Or at least you shouldn’t. So if you perform with your computer it might be a smart idea to have a portable one. Or two of them if your budget allows. The overall efficiency. That means for example, that i7 processor is in general better than a similar in parameters but much older Core2Duo. CPU cores clock rate: most of audio processing tasks can not be divided between several cores. So a great quad-core unit will do better than decent eight-core CPU with lower frequency rate per core. The ability to tune up the frequency: within a reasonable brackets you can speed up. Remember however that too much tuning leads to overheating. Overheating means the need for a better (and louder) cooling system. If you compare two similar processors look at their usual work temperatures. The higher value will require better cooling which means more sounds from inside your computer. It is very, very important to buy SSD drive. Solid State Discs are quiet and lightning fast. The difference between them and traditional hard drive is huge. But there is also a great price gap. So the best practice is to keep the OS, programs and the most used data on SSD and the rest on HDD. You will need a 500GB SSD and at least 1TB of traditional HDD. The WAV files which contain uncompressed sounds are extremely big. The sample packs collection will also require much space. Don’t use external USB storage for your projects. The USB port is too slow for you and it will affect heavily on your sound. You can and should however create backups on such drive. This can be the place for the part of your sample packs library too. You never know when you will need to restore a corrupted project or (hope not!) data stolen along with your laptop after a gig. Speech is silver but the silence is gold. This old saying seems to be a perfect way to describe your computer. You don’t want to sit hours with your waveforms and cutting the low frequencies from your records, do you? You will prevent your machine from overheating by providing a strong CPU and nice cooling system. Watch out! This is the place where computer vendors like to save their money. There is a myth that extreme amounts of RAM memory are one of the most important things when you buy a music production computer. Nope! 8GB of RAM is absolutely enough. If you get 16 you can rest easy for the next several years without the need for upgrade. Graphic Processing Unit is not directly important but you surely want one if you don’t want your CPU to handle the graphic requests while processing MIDI signals. So the best choice is to select a mid-range device with passive cooling unit. Last thing, often overlooked is the power supply. You need to have a stable power source with silent cooling system. Also, having many extension cards inside your computer (a soundcard, GPU, various hard drives, etc.) requires a bit more power to work properly. I don’t have to tell you about the importance of your screen. Many music producers use their laptops as a base but display their projects on external monitors. A great way to improve your workflow is to have two big screen monitors. I am talking here about at least 17” ones with good view angles to connect to your music production computer. This is a sad part of my article. A music production computer is an expensive toy (or tool). That is why in general it is better to buy all the parts separately and put something together. Previous articleWhich studio monitors should I choose?